New research has found that nearly three-quarters of major multinationals are reviewing their current agency arrangements, looking at whether they have the right mix of agencies and capabilities in their external partners. 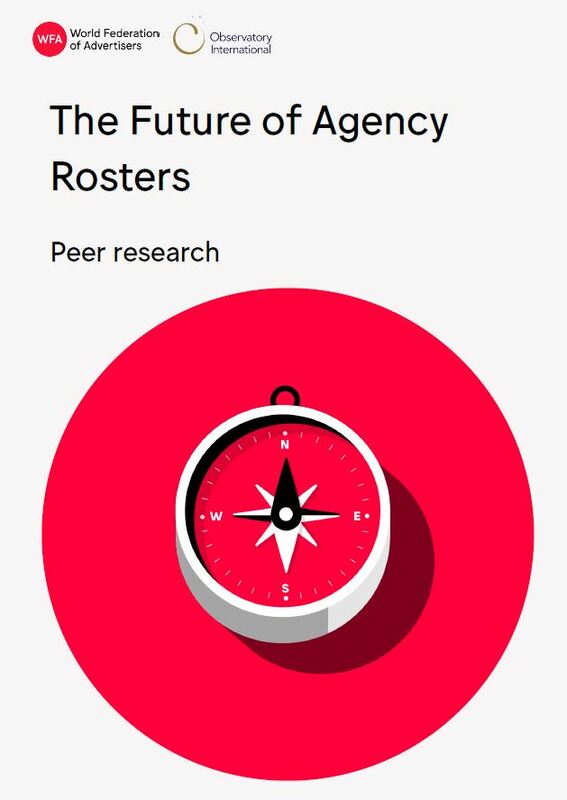 The Future of Agency Rosters by the WFA and strategic partner The Observatory International has found that many clients recognise their current roster set up is not working effectively, rating it just 5.7 out of 10, where 10 is fit for purpose. Agencies were even more sceptical about the effectiveness of current roster arrangements, scoring them at just 5.2 out of 10. The findings are based on responses from 50 multinational marketers representing a total global ad spend in excess of $69bn. Twenty-six agency representatives contributed, with more than 50% in global/regional roles and the balance evenly spread across the globe. The current dominant model of agency management is “multiple agencies managed individually by marketing” (81%), with “integrated lead agency” (44%) and “network agency with specialisms from same holding company” (39%) coming next. However, many advertisers use a variety of core models across their operations, underlining the complexities of developing fit-for-purpose roster architectures around the globe. And that challenge may become more complex because while nearly 60% said they were looking to reduce the numbers of agencies on their roster over time, in answer to another question just over 50% said there were seeking to increase the numbers of specialists they use. The good news for agencies is that 82% per cent of advertisers do not foresee a world without agencies. Agencies feel that clients do not provide them with the right tools to deliver the expected results. Collaboration can be hindered by internal structures (51%), poor quality briefings (49%), approvals and sign off processes (40%), lack of trained client personnel (40%) as well as lack of a clear data strategy (52%). All of which, they argue, undermine the quality of agency work. Clients agree and nearly 50% recognised that their own internal structures may be an encumbrance to operating the most effective roster model. However, clients feel that agencies across the ecosystem have some way to go to provide quality delivery. The biggest areas of concern were ROI measurement across channels, when it comes to informing the whole roster through data, analytics and insights, as well as clearly understanding the end-to-end consumer journey. Eighty-four percent of clients also believe that agencies are struggling with MarTech – and 71% of agencies agree – underlining the complexities of this area and the reason why management consultants have spotted an opportunity. “These findings highlight the challenges that each side faces and there’s clearly plenty of improvement that everyone can make. Whatever roster arrangements brands develop, they should ensure that they can deliver on their promises to their agency partners. Without that, no roster model will be able to work effectively,” said Stephan Loerke, CEO at the WFA. “We are dealing with a fundamental shift in the way consumers behave and how they access media. Advertisers need to take the lead in developing a new kind of partnership if they truly want to achieve one to one marketing at scale. That requires new skills but also involves working closely with their agencies, which often have huge knowledge about the companies they work with,” says Roel de Vries, Corporate VP, Global Head of Marketing, Communications and Brand Strategy at Nissan. “Clients want their roster to be made up of impartial business partners with real knowledge of their customers. Change will be needed on both sides to turn this vision into reality. True partnership will require increased commitment and transparency from both clients and agencies.” said Lucinda Peniston-Baines, co-founder and Managing Partner at The Observatory International.